Located in Maharashtra, India, we are actively making available superior quality Industrial Washers to all the buyers. The Industrial Washers that we deal in are designed and fabricated in compliance with the international quality standards. We make use of quality tested raw metal that is non-corrosive and highly durable so as to enhance their performance. 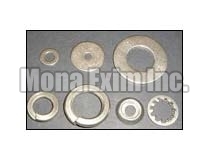 Our Industrial Washers are obtainable at the moderate prices from us.